The 1991 Libertarian National Convention was held in Chicago, Illinois from August 29 to August 31, 1991. 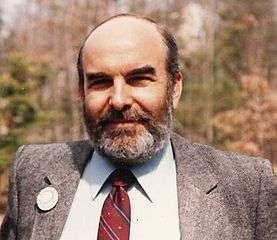 Andre Marrou of Alaska was chosen as the Libertarian Party's nominee for President of the United States in the 1992 election. Andre Marrou was elected on the first ballot, gathering a majority of the voting delegates, securing nomination. A separate vote was held for the vice presidential nomination. Nancy Lord was nominated on the third ballot. After the second ballot, Ruwart dropped out of the race. Nancy Lord defeated Richard Boddie on the third ballot, securing the Libertarian Party nomination for Vice President. ↑ Walsh, Edward (September 1, 1991). "Libertarian Party Nominates Real Estate Broker for Run at a Million Votes". The Washington Post via HighBeam Research (subscription required). Retrieved May 27, 2012. ↑ Arthur, Chester Alan (November 1991). "My Kind of Town" (PDF). Liberty Magazine via Ludwig Von Mises Institute. p. 41. Retrieved May 27, 2012. ↑ Arthur, Chester Alan (November 1991). "My Kind of Town" (PDF). Liberty Magazine via Ludwig Von Mises Institute. pp. 41–42. Retrieved May 27, 2012.